For many years, all of our Husson's Pizza television commercials started with that line. Then I got bumped by Mick The Chef! Seriously? A puppet! Just joking, Mick. Don’t get all bent out of shape! Hopefully, I won't get bumped by Mick off of my own blog, too! We at Husson's have talked for a long time about starting a blog that let's you get to know us better, so let me start off by telling you a little bit about me and Husson's before telling you more about this blog. Husson's is unlike the majority of pizza places in the Charleston, WV area, in that it started right here in 1977 with the opening of the first store in St. Albans. My father and I worked tirelessly that first year. In fact, every single pizza that was served that first year was made by either me or my father. Then in 1979, I married my wife Sharon and brought her into the business. Although we've seen a lot of growth and change since 1977, we're committed to staying a family-owned, family-operated, and family-oriented business. 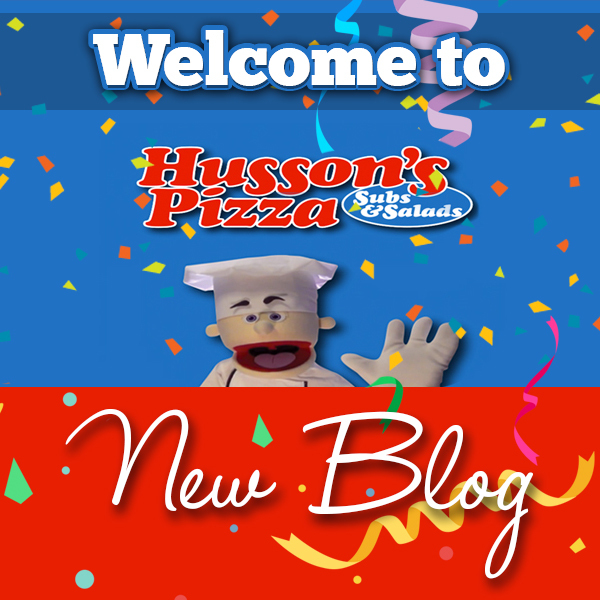 In future blogs, you can expect to see future blogs on a variety of topics related to Husson's Pizza and pizza in general, including new item descriptions, featured menu items, community events, frequently asked questions, featured customers, featured employees, and more. There are a lot of customers and friends that have been with us since the beginning. It would be great for some of you to share your thoughts, stories, or memories from our almost 40 years of living and working together in the same communities. People often like to share memories with us of eating Husson's Pizza when they were a kid. We’ve served many kids pizza for lunch in the past and are now serving their kids pizza, both in our restaurants and through the school lunch program. One customer recently stopped in at our Pinch, WV location after being gone from the area for almost 20 years. They still had great memories of their little sister's birthday party held there in the mid-1990's and were super excited to see that we still had the jukebox for their kids to play with while eating pizza. Do you have a great memory you'd like to share? We'd love to hear it. And if there's anything that you would like to know more about or any topic you think might be interesting for this blog, I would be happy to explore it. Just let me know in the comments below.